The increase in renewable capacity is eroding gas plant generation margins across Europe. At the same time there is an increasing system requirement for gas plant flexibility to support renewable intermittency. This paradox is challenging the orderly operation of wholesale power markets in Europe. But it remains unclear how intermittent renewable and gas-fired plant will happily coexist. The UK response to gas plant remuneration may well form the blueprint for other European markets to follow. The increase in renewable capacity is eroding gas plant generation margins across Europe. At the same time there is an increasing system requirement for gas plant flexibility to support renewable intermittency. This paradox is challenging the orderly operation of wholesale power markets in Europe. But it remains unclear how intermittent renewable and gas-fired plant will happily coexist. In this article we focus on the interaction between renewable and gas capacity by exploring their impact on supply curve dynamics. The issues are similar across most European power markets, but we have chosen the UK as a case study given its tight capacity margin and security of supply issues. The UK response to gas plant remuneration may well form the blueprint for other European markets to follow. Commodity prices and government policy are conspiring against gas plant across Europe. The precipitous fall in coal prices over the last two years has resulted in coal plant sitting clearly ahead of gas plant in the generation merit order. At the same time, government support for low variable cost renewable capacity is eroding gas plant generation margins. These factors are best understood by considering their impact on the generation supply curve. While the effects are similar across most of Europe, we focus on the UK market as an illustration. Chart 1 shows the UK generation supply curve. UK plant are ranked by short run marginal cost based on forward fuel and carbon prices for the 2013-14 gas year (Oct 13 – Sep 14). The volume of intermittent renewable capacity is de-rated for average plant load factors (e.g. average wind conditions). So the chart shows a snapshot of supply given average conditions across the year. Source: Timera Energy. Note: Supply stack reflects average plant & interconnector availability. Actual plant & interconnector operation will differ at any specific point in time depending on availability, system requirements & market conditions. Government support is expanding the low cost tranches of renewable capacity (wind, solar, biomass) at the left of the supply curve. This pushes the market price setting tranches of gas and coal capacity to the right, reducing thermal plant load factors. As a result, demand (illustrated via max, average and min annual levels) is met by cheaper plant, dragging down wholesale power prices. Lower load factors and lower power prices are eroding gas plant margins and value. It is difficult to get a clear picture of the impact of renewable intermittency by looking at the supply curve snapshot in Chart 1 which only shows annual average load factors. A different approach is required in order to appreciate the impact of swings in the output of intermittent capacity. It is more helpful creating a supply curve net of uncontrollable generation (e.g. wind, solar and interconnectors). Uncontrollable generation can then be netted of system demand to generate a net load-duration curve as illustrated in Chart 2. The left hand vertical axis in Chart 2 again shows the marginal cost of plant as for Chart 1. But the load duration curve which is overlaid, is measured against the right hand axis and shows the range of system demand (net of uncontrollable generation) from the lowest hour in the year (top left = 100%, ~56GW), to the highest hour of the year (bottom right = 0%, ~17GW). 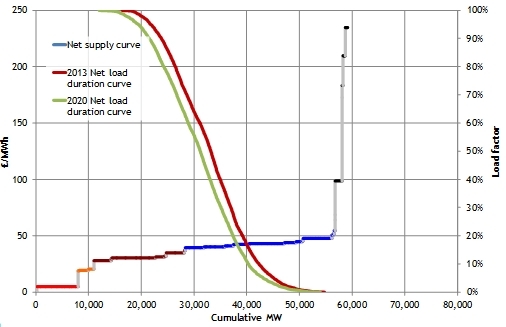 The red net load duration gives an indication of current conditions based on actual 2012 demand, wind and interconnector flows. Source: Timera Energy. 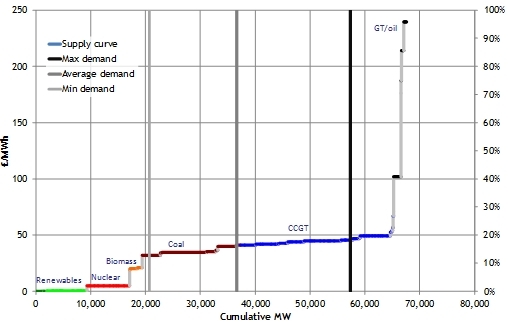 Note: 2012 relationship between demand, wind, hydro and interconnectors has been used to project net load duration curve. Load factors are indicative only. The impact of adding another 10 GW of intermittent renewable capacity to the UK stack this decade is illustrated with the green net load duration curve. Compared to the red curve, the green net load duration curve stretches to the left as average renewable output increases, but peak net system demand (bottom right = 0%) is largely unaffected. Adding wind and solar capacity reduces average net system demand across the year. But there are still hours in the year when the wind doesn’t blow and the sun doesn’t shine. New renewable capacity has little impact on the volume of backup gas plant capacity required to maintain security of supply. It also increases transmissions stress and system balancing issues. So in order to maintain security of supply, gas plant needs to be adequately remunerated for providing flexibility support. Market remuneration: Gas plant returns increase in the fewer hours of the year that plants operate i.e. there is an increase in market and balancing mechanism volatility and ‘super peak’ pricing. While the market may deliver this outcome if left alone, regulatory authorities may not tolerate the associated price volatility. Capacity/reserve payments: Regulatory authorities step in to provide support for gas plant via new revenue streams outside the wholesale energy market e.g. via capacity market and/or supplementary reserve payments. This looks to be the route the UK will pursue. Under remuneration: There is inadequate remuneration for flexible gas plant, causing plant closures and a tightening capacity margin. This describes the current conditions across much of North West Europe given surplus capacity, although as thermal capacity closes 1. or 2. will eventually need to happen if security of supply is to be maintained. Support for renewable capacity is set to continue to erode gas plant load factors. But the key question for gas plant owners is how incremental flexible capacity will be remunerated going forward. Via wholesale market spreads and volatility, via a capacity market or via balancing and reserve payments. The UK, given its relatively tight capacity situation, is the ‘canary in the coal mine’ for European power markets. In an article to follow, we will consider how the uncertain evolution of plant remuneration impacts gas plant valuation.